Last weekend I took my girls apple picking at a local you-pick farm. The have a blast running around an orchard. We picked about 10 pounds of apples and I'm glad that I decided to make the applesauce when I did because the apples were almost gone. It took about 5 lbs to make the applesauce. Here's how it goes. Peel, core and cut the apple pieces into chunks. I used both golden delicious and red delicious apples. Add the additional ingredients and cook for 3-4 hours on high or 7-8 hours on low. I went with high so it would be ready by dinner. Once it is done take a potato masher and mush it into applesauce. Once it cools them store it in the fridge for up to an hour (if it lasts that long). Yummmy. I bet your house smelled divine while you made it! Oh my goodness it did. 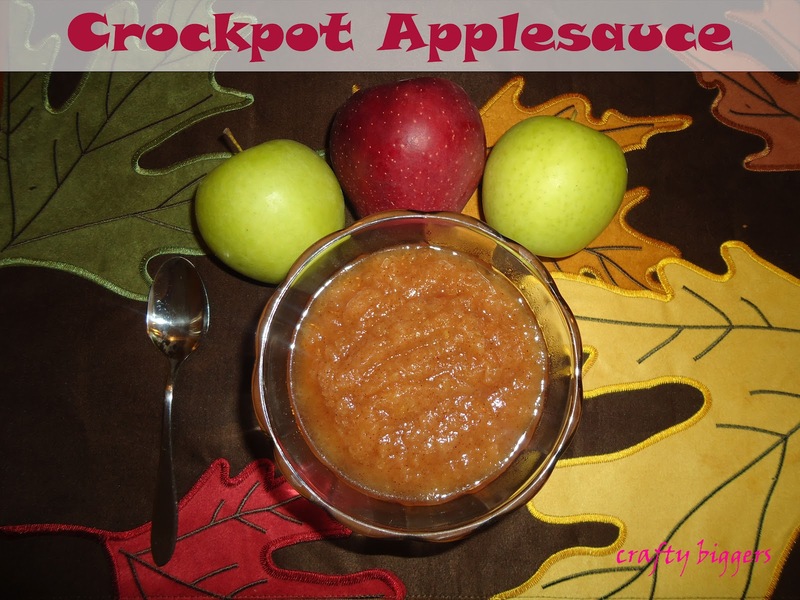 I love crock pot anything, but I gotta say, nothing says 'fall' like homemade applesauce! Looks delicious! Pinning this one! Thanks for joining the party at Keep Calm and Link Up! Thanks! This is only the second food I've ever cooking my crock pot. I usually just use it to keeps food warm at pot lucks. That's a great recipe. I love the idea of making homemade apple sauce this time of the year. I would love for you to link this up to my Fall into Fall party that opens tonight at 8pm EST. Hope to see you there. Thanks for the invite. I'll be sure to stop by and check it out. Thanks for stopping by. It smelled amazing.